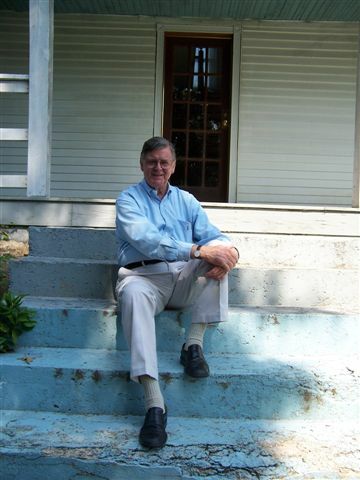 One of my favorite photos of Earl Hamner Jr., sitting on the front steps of his childhood home in Schuyler, Virginia. Yesterday, March 24th, Earl Hamner Jr. went Home to be with the Lord. I am lost for words. It has hit me very hard. Several times today, I wept. This is just about the exact spot where my dad and I spoke with Earl Hamner Jr., one summer afternoon. Ike Godsey’s store is in the direction, behind me, about a half-mile up the road. My dad and I used to visit Schuyler, Virginia, the real Walton’s Mountain, quite a bit. 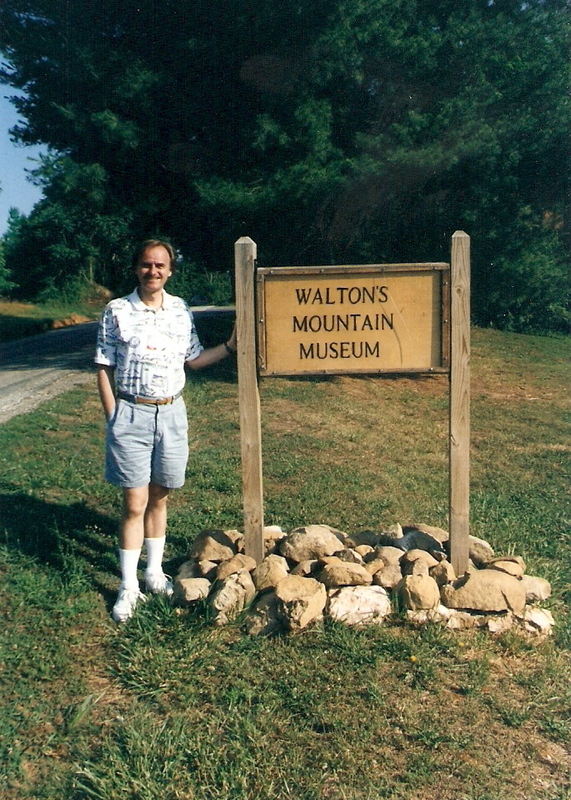 One time, Dad and I were just outside the Walton’s Mountain Museum. The Hamner homestead is right across the street from the museum, slightly diagonal and on your left hand side as you face the side of the Hamner homestead. Ike Godsey’s store is up the hill, I’d say about a half-mile up the hill. Dad and I were talking with each other and taking pictures. As if the odds were five million to one, we saw Earl Hamner Jr. walking down the road, with a brown paper bag, filled with groceries. Earl was visiting his family. Long story short. Dad and I did talk to Earl for a while. I remember that he was so very friendly, kind and unassuming. Time is a funny thing. I’m not exactly sure how long it was that we talked to Earl. I’d say that it was probably about 15 to 20 minutes or so. It was an honor to meet and talk with Earl. 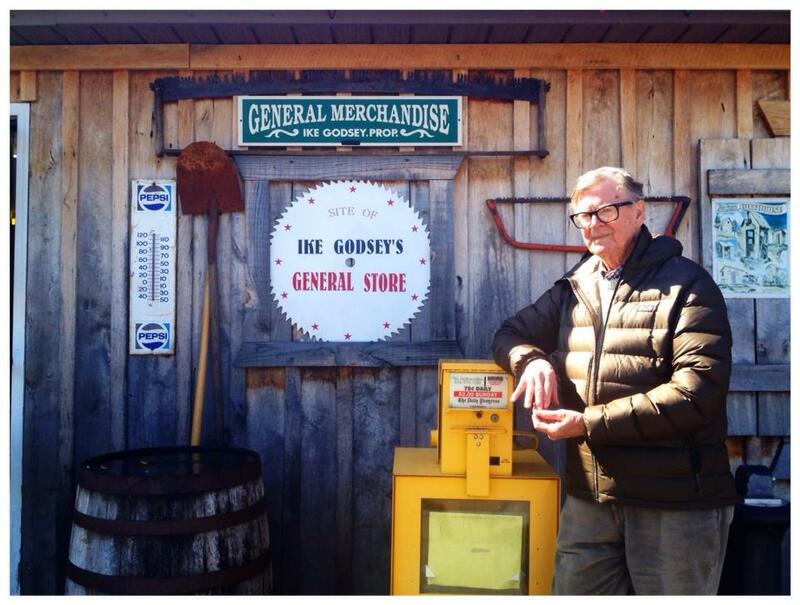 Simply a great photo of Earl Hamner Jr. standing in front of Ike Godsey’s store. A couple of years ago, I wrote an essay about the history of the Mabey family. I included it in my blog. My main purpose in writing this blog, was to provide a bit of information for my cousins about the heritage of the Mabey family. The Morris Canal was important to the Mabey family. My forefathers actually helped to build the canal. My great grandfather had an ice house right along the old tow path. My grandfather was the chief engineer of Incline Plane Ten East. I included this essay in my blog series. Well, lo and behold, about a year and a half ago, I was talking on the telephone with Ray Castro. Ray is the gentleman who directed Earl’s biographical film, “Storyteller.” Ray gave me such a boost when he told me that Earl had read my blog on the Mabey heritage and liked it a lot. I was so very truly honored. In the last couple of years, I have written a few tributes to Earl Hamner Jr. in my blog. I was so deeply honored when Earl elected to share my tribute to him, on his own Facebook page. Also, several times, Earl has written me short little notes of positive feedback on some of the essays on my blog. Something that I dearly cherish. I love this photo. 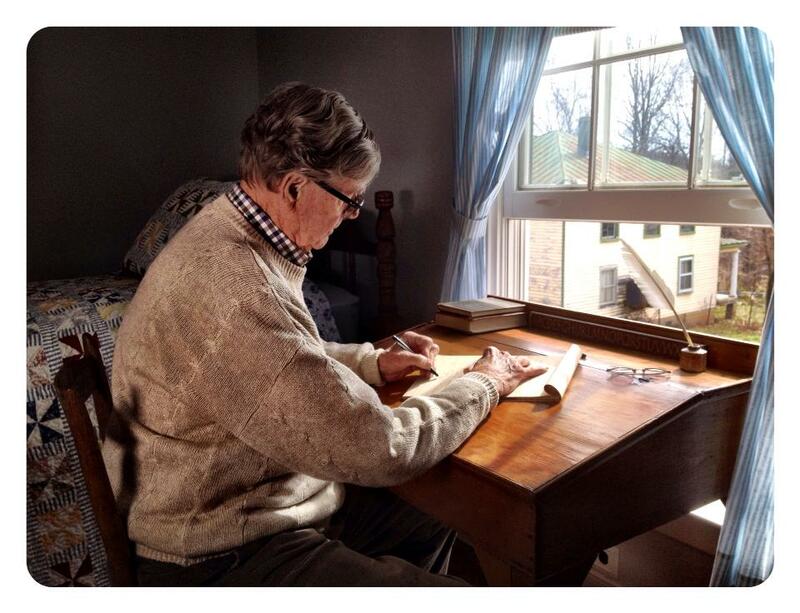 It shows Earl Hamner Jr. sitting at his old desk inside his old bedroom in his childhood home. I played a small role in the movement to work toward the goal of having Earl Hamner Jr. receive the Kennedy Center Honors Award. Sadly, so very sadly, this never came to pass. This is something that very dearly breaks my heart. Earl so very much deserved to be a Kennedy Center Honoree. I’ll never understand why he was never chosen for this award. Earl Hamner Jr. gave to us all the gift of finding the crown jewel in the ordinary, plain, mundane moments in life. He found nobility in common people. He showed us the positive power of human love. He taught us that to be wealthy, one does not have to have a big bank account. For a man or woman can have the wealth of an endearing family, cherished neighbors and close friends. Earl taught us to count our blessings in life, even the seemingly small blessings. I love, respect and admire Earl Hamner Jr. for all he has given unto the human race. He taught us that it is better to light one candle than to curse the darkness. I am deeply, deeply saddened by his passing. This entry was posted in Dad, Dreams, Earl Hamner Jr., Encouragement, Faith, Friendship, Giving, Healing, Homecoming, Kindness, Life's Dreams, Memory, Morris Canal, Small Town America, The Waltons, Virginia, Wisdom. Bookmark the permalink. Its remarkable that you got to meet Earl in that very special place. It reminds me what a special person he was and how much he will be missed.